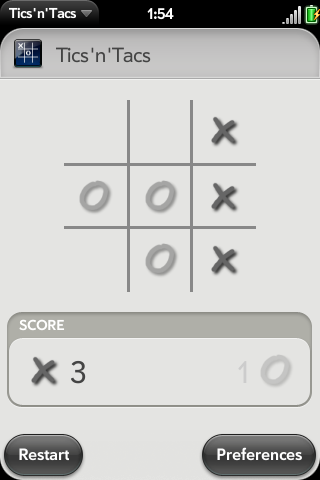 I know there is already a Tic-Tac-Toe game available but this simple game is perfect to get into touch with webOS programming so I have written my own Tic-Tac-Toe with the name Tics'n'Tacs. I have no access to a real Palm Pre yet (It's not available in Germany yet...) so its currently only tested in the latest emulator. I hope it also runs on a physical Pre. Both sides can be played by a human player or by one of four different computer AIs. So you can play human vs. human, human vs. Pre or even Pre vs. Pre. AI levels are: Toaster (Does only random moves), C3PO (Only knows the basic moves), Marvin (Knows even the special moves but is sometimes to depressed to use them) and HAL 9000 (Knows all the special moves and uses them, so it should be impossible to win against him). While this application should be a complete game the whole project is more like a learning application. So if you like please review the source code and inform me if you found something which could be done better or if you think the GUI does not conform to the webOS style guides or something like that.